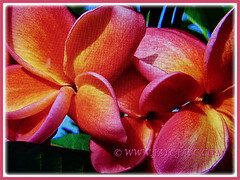 Plumeria or Frangipani comes in an explosion of colours. So many varieties to choose from to add colour and brighten your garden. 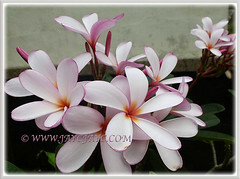 Plumeria are easily propagated from cuttings. 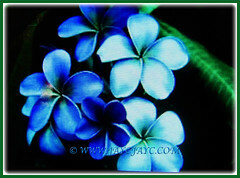 Generally, Plumeria that are propagated from cuttings may bloom within the first year. And, they are popularly grown by gardeners as they are year round bloomers. 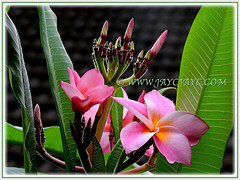 These Frangipani trees with exotic tropical flowers will provide fragrance to their garden. 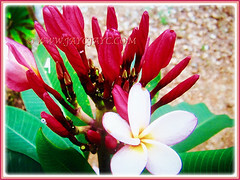 So, hurry to the garden nurseries in your neighbourhood to buy a Plumeria to add to your garden. 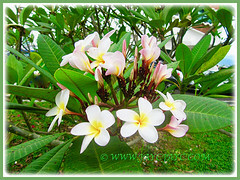 Common Names: Frangipani, Plumeria (also used as a common name). Etymology: The genus name Plumeria is named in honour of the 17th century French botanist Charles Plumier. The common name Frangipani comes from the 16th century Marquess of the noble family in Italy who invented a plumeria-scented perfume. Origin: Native to Mexico, Central America, the Caribbean and as far south as Brazil. They are naturalised plants in southern and southeastern Asia and worldwide. 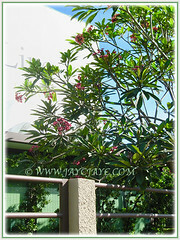 Plant type: An ornamental tropical tree. 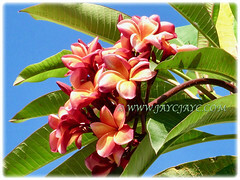 Features: Plumeria comprises of about a dozen accepted species of flowering plants. 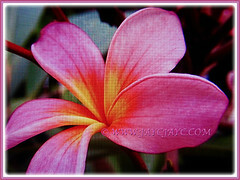 Plumeria is generally a small tree growing to below 9 meter tall. It comes in many sizes, including the dwarf ones, the medium and the tall ones too. Its broad and usually round-head canopy is often about as wide as its height. Some cultivars are upright and compact while others are lanky with an open canopy. Dwarf types are becoming available with good evergreen foliage but the flower qualities are poor. The flowers are tubular, expanding into a pinwheel of five petals that averages 5-7.6 cm in diameter. It may be white, red, yellow, pink, blue, purple or multiple colours. The hybrids differ in their profusion of blooms, with some producing more than 200 flowers per cluster and others only 50-60 flowers. When the blooms first open, it may have very vibrant colours and very strong scent. The longer the bloom stays open, the colours and fragrance will slowly vanish. A single inflorescence may bear flowers for five months, although the last flowers are small and infrequent. The flowers come in varying colours of white, pink, red, orangy-red and multiple colours. 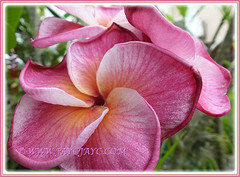 Plumeria flowers are most fragrant at night in order to lure sphinx moths to pollinate them. The flowers yield no nectar, but simply to dupe their pollinators. Plumerias only occasionally produce seed. When pollinated, the flower produces two hard, narrow, pointed pods up to 17 cm. long containing 20-60 winged seeds. Maturation of the seed pods is usually in early spring from a pervious season’s pollination. 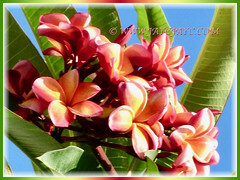 Culture (Care): Plumeria or Frangipani can be easily grown with minimum care. Moisture: Moderate water needs. It has moderate wind resistance and salt tolerance. Soil: Best in slightly acidic and well-drained soil. However, it can tolerate any commercial garden soil with good drainage. Others: Prune to keep the canopy low, encourage branching and making harvesting of flowers more convenient, especially for commercial flower production. Branched cuttings are selected for propagating and the branch axil is set low to the ground to result in a shorter-statured plant. 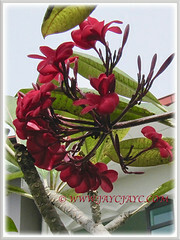 Once established in the ground, a Plumeria can reach 0.6-0.9 meter in 6 years, given adequate fertilizer and moisture. 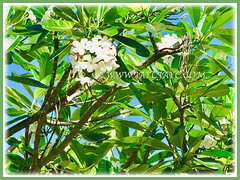 Feed Plumeria with 10-30-10 every 3-4 months, distributing the fertilizer around the plant to 0.6 meter beyond the foliage line. Stems that are shrivelled, bent and have been infested with the plumeria stem borer should be removed back to their juncture with a main branch (or lower if there is internal discolouration) and destroyed. 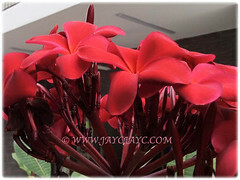 Take note that all parts of Plumeria exude a milky latex when damaged. The poisonous latex may irritate eyes and skin. Generally Plumeria has few disease problems. However, do watch out for a black mould that may develop on stems and leaves when scale insects, whiteflies or mealybugs are present. 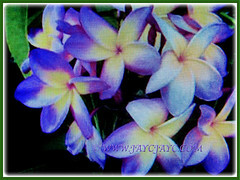 Plumeria grows best in zones mentioned above. There is a Plumeria species known as Plumeria obtusa, commonly known as ‘Singapore’ that retains its leaves and flowers in winter. For deciduous types, the leaves will fall during winter and new leaves will emerge during or following the spring flowering period. Pruning is easiest in winter, allowing leaf drop, but heavy pruning sacrifices the spring bloom. Propagation: Easily from cuttings of 30-60 cm long leafless stem tips in spring. Cuttings are allowed to dry at the base before planting in well-drained soil. Cuttings are particularly susceptible to rot in moist soil. 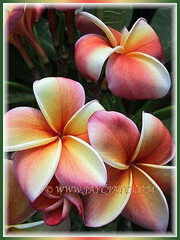 Alternatively, Plumeria can be propagated from seeds that take about 3 years or more to produce flowers. Tip cuttings is the preferred choice since plants started from cuttings will generally flower within the first year. 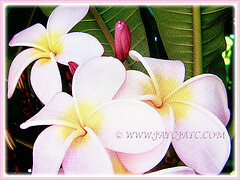 Usage: Plumeria is ideal as a common ornamental in yards and in other planned landscapes. It can be ground grown or in large tubs/containers. A beautiful addition to any tropical garden. 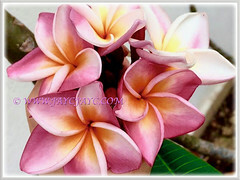 Plumeria or Frangipani are excellent as an accent or specimen plant or for flower production to adorn the hair or simply for their fragrance.